We have a small bathroom with limited counter space and somehow, all four of us ended up using different types of tooth paste. Talia, Ken, & I all have sensitive teeth, but mine are more sensitive, so I use a stronger sensitivity tooth paste. Katrina can't stand the taste of mint. Talia and Ken don't like the same flavour of paste. So, we ended up with a counter that was taken over by tooth pastes! If you've got this problem, I think you're gonna like this D.I.Y. solution that I came up with! So I liked the hot iron holster, but when I got looking through their other products, I got excited about their Hobby Holster (I'll share a photo of that on my Instagram later, so stay tuned over there), and then the "Lil' Holsters"... the Lil' Holsters became our tooth brush & tooth paste solution! All I needed was a picture frame, a piece of scrapbook paper & 4 Lil' Holsters and in less than a minute, I had created the easiest D.I.Y. 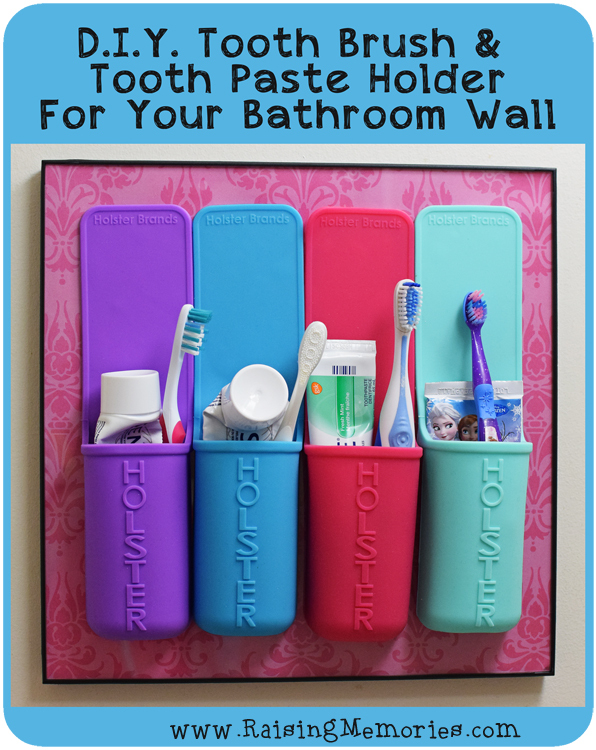 hanging tooth brush and tooth paste holder in the history of mouth hygiene! Disclosure: Holster Brands sent me these holsters so I could share this project idea with you. As always, all ideas and opinions shared here are my own. What a fantastic (and colourful) idea! Not only handy but easy to clean any toothpaste drips! Thanks for sharing your great idea! I love the holster idea; I haven't seem them before. They keep everything neat, clean and organized. Great idea. That is such a great idea. I feel like I should have more people living in my home than actually do by the amount of toothbrushes we have. This is such a neat idea and I'll bet the kids find it cool too. oh that would get annoying. These would totally stick on a shower wall, too- I'm thinking they'd be good for holding razors, too! Love this idea! We have the same problem and I hate it! Very useful, I also knock over my toothbrush when I'm in the bathroom, now I finally have somewhere to put it with this holder. I like the idea, but use the sonic clean toothbrushes, so I don't think they'd fit. But I love the idea for a hair ion. Thank you. Yeah, I wouldn't suggest it even if they do fit, because they're probably heavier. They're great tools for the counter though, and the ones for heat tools are amazing! Ok this is such an awesome product. My son has special needs & this would be perfect for him to know exactly where his toothbrush is. Love this! This is such a great DIY project and it's so simple. Do they really stick and they never fall ? What a great way to organize your bathroom. 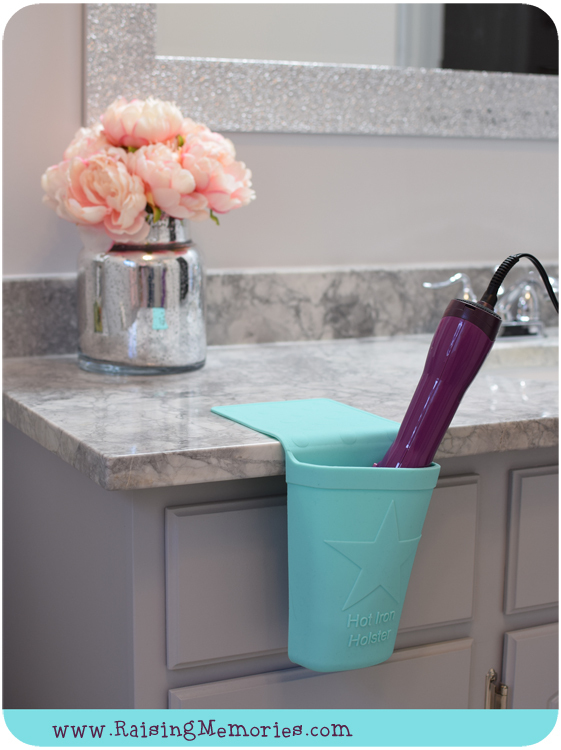 We had some trouble after a while, with the heavier toothbrushes and toothpaste, but we haven't had any issues with the ones that we use on the counter with curling and straightening tools! This would keep everything tidy. Much nicer then in a cup on the countertop. Sometimes it is the little things that make so much difference, great idea. I am not a fan of brushes and paste showing but this is very cute looking. I really like this and easy for the kids to use ! Tons of Free Easter Printables!